Happy February friends! 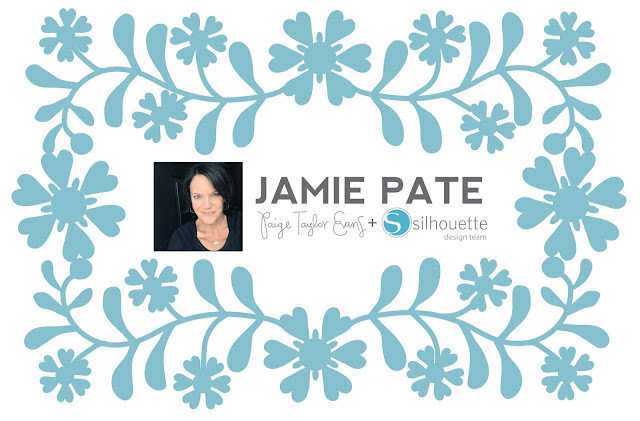 Jamie Pate here with my first layout for the Paige Evans + Silhouette Design Team. I am inspired to be here and on this team. Today I have a classic 12x12 layout using the Wonky Hearts Background plus the Beautiful cut file. It’s February and that means hearts! Being the traditionalist that I am, hearts was the perfect go-to cut to kick off this fresh new month. When I spied that Wonky Hearts Background I knew what I wanted to do and held my breath hoping it would work. 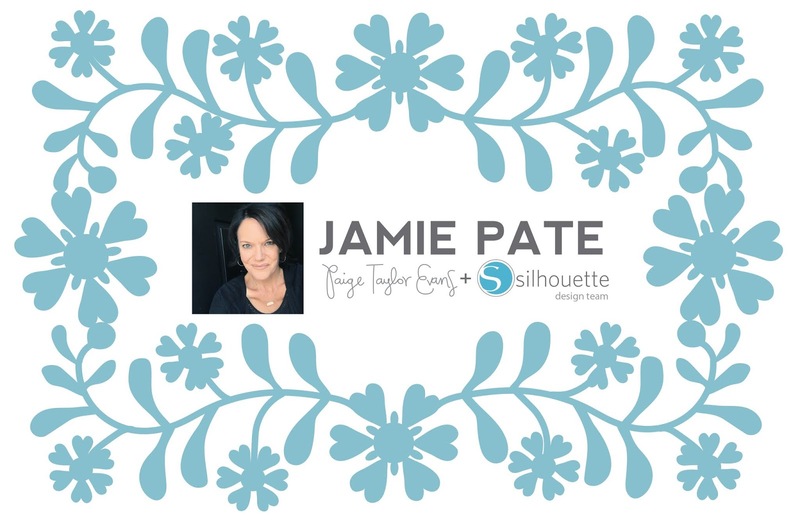 Pulling the positive image off the mat, I used it as a template on the 12x12 white cardstock background. Then, with my handy dandy glue gun (and don’t judge the condition of that gun in the process video…wink!) I adhered the cute, little wonky hearts to the cardstock to create a dimensional heart-filled background. This layout uses the Heidi Swapp Color Fresh collection. It’s a bright and bold collection but choosing a pink ombre background paper lent itself to a super soft vibe happening on this page. Realigning the hearts right back on the page as they were originally aligned in the cut created this subtle exchange of color from soft pink to a bit bolder pink. The hearts were hot glued to the page. I love my glue gun. Have hot glue gun will craft. Using this adhesive technique only added to the “wonky” feature of the cut file. By adhering each heart with a dab of glue the hearts are raised a little from the page and not perfectly flat on the background. This gives great texture and dimension and mostly interest to this page. I really love how the background turned out. The Beautiful cut file played title to this layout. 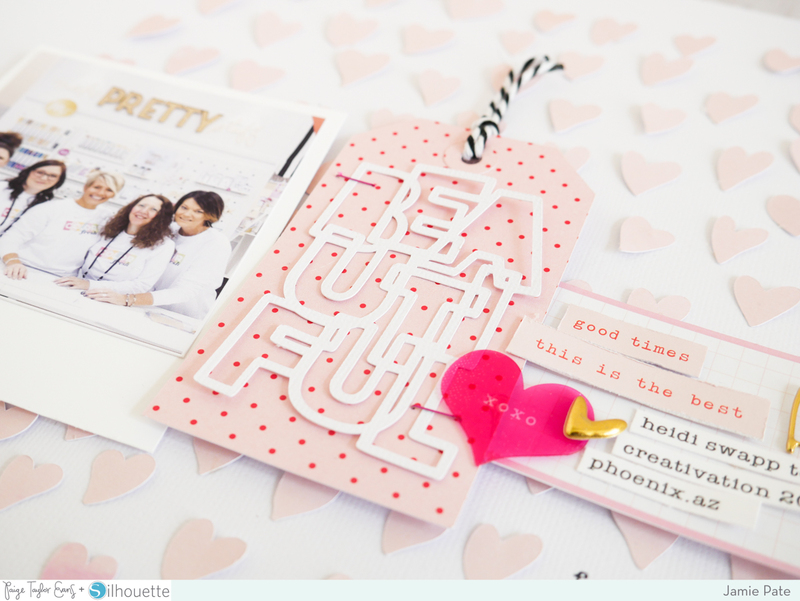 The cut was made on white textured cardstock and then stapled to a patterned paper tag. This allowed a subtle but important pop to the over all page. The white cardstock played back to the white background of the layout. 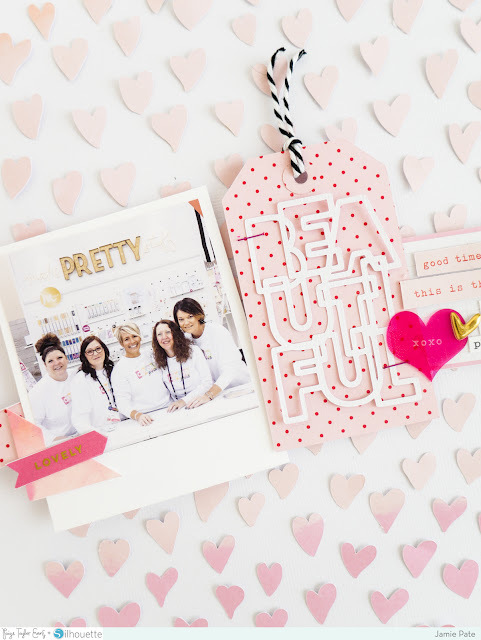 The pink of the tag played up the subtle colors of the photo and other embellishments. The photo, tag, as well as journaling spot were all adhered to the page with dimensional adhesive. This gave way to even more pop to the background. Keeping the embellishments pink with only a subtle touch of brighter pink as well as some gold foil played up the overall cohesiveness of the page. It allowed the photo to not be lost on the page. It gave way to what I think is a beautiful story. This is gorgeous! LOVING the hearts!!!!! A very pretty layout. I like the way you used the negative and positive of the cut file, which looks great with an ombré paper. An idea to borrow. Thank you. This is so beautiful, Jamie. I would have likely never bought the "beautiful" file just looking at it in the SDS. I'm getting it now!! !